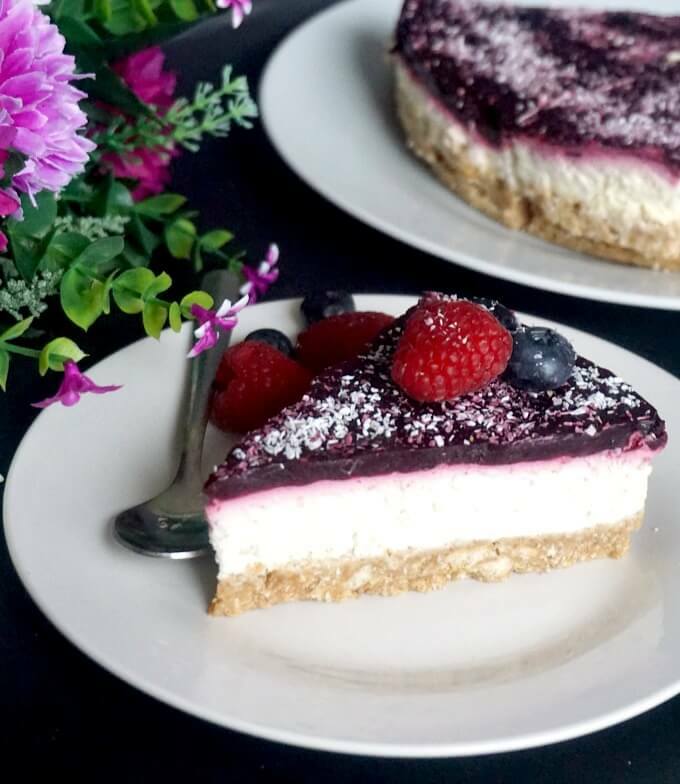 Luscious coconut cheesecake sweetened with maple syrup and topped with berry jelly, a guilt-free dessert that has no refined-sugar added. The ideal kid-friendly birthday cake that grown-ups will also adore. Where has the time gone? My younger daughter is now one year old, I cannot believe that my cute little baby has just stepped into toddlerhood. Which means we now have two toddlers, my older daughter being just over two and a half years old. I know, two toddlers!!! If the idea of a little creature set to distroy everything around might scare you, well, just double it. It’s also fun, don’t get me wrong, the two of them are some serious cutie pies that bring us so much joy. So, such an occasion calls for celebration! And, of course, a nice brithday cake. I don’t like my little ones having to many sugary treats, so I decided to make something that they will really enjoy, and will give me peace of mind that it was not too bad for them either. I was at frist debating whether to go again for a Nutella Cheesecake or a Triple Chocolate Cheesecake with Mascarpone, but I thought I better go for no refined sugar at all. With little ones, full-fat diary products are the best, no need to fill their tummies with non-fat stuff, their bodies need the fat that grown-ups try their best to avoid. And if you have to choose the lesser of the two evils, I woul happily choose to sweeten any dessert with maple syrup or honey, rather than refined sugar. Careful though with honey if the child is under one, as it’s very dangerous. Maple syrup, on the other hand is considered safe for that age. Even so, I wouldn’t go crazy with too much syrup either, no need for that. I am by no means trying to put the kids in a crystal ball and deprive them of all the things sweet, my older one has a serious sweet tooth, but if I can avoid giving them processed, sugary stuff, then I do. So, this coconut cheesecake seemed like the ideal option here. 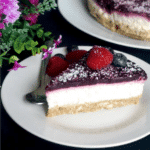 Not too sweet, but not bland either, with a delicious berry sauce that screams perfection, and that creamy cheese filling that is so divinely silky and smooth. Now, beat that if you can! With cheesecakes, gelatine is not always compulsory. In fact, once refrigerated, the cheesecake will settle nicely anyway, but I decided to use the gelatin to make sure the cake looks perfect on the big day. After all, we had some little guests to impress, right? 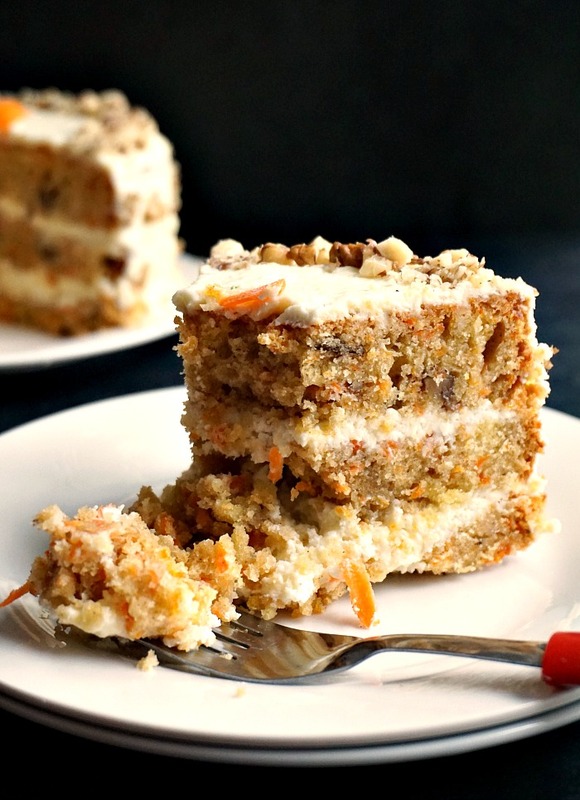 I would strongly advise you make this cake the night before, so it can have time to settle overnight, and enjoy it on the day. 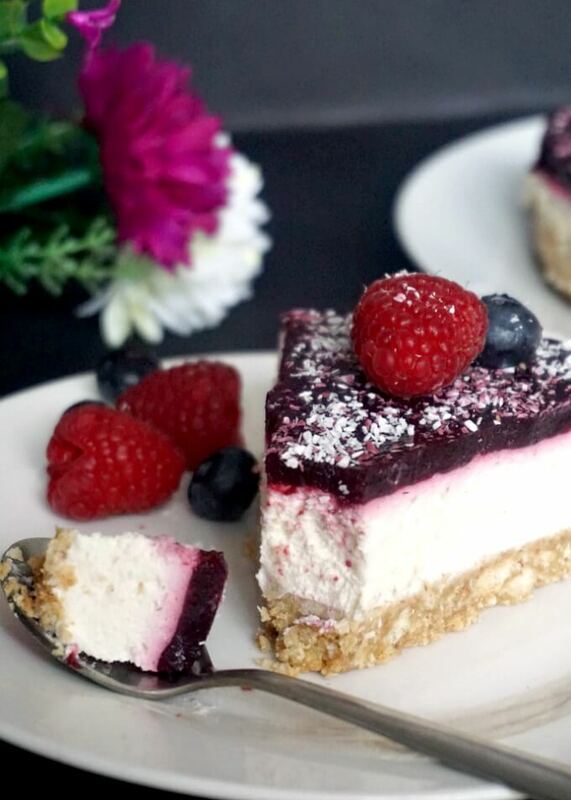 Cheesecakes are absolutely delicious cold straight from the fridge. For the topping, either fresh or frozen fruit can be used. The frozen ones are just as good, and even cheaper, especially when the berries are not in season. Just cook them on the stove top with water until they thicken into a sauce, pass through a sieve to discard of any bits in there, then mix with the gelatine, and that’s it. All you need to do after is top the cheesecake, and let it set in the fridge for a few hours. It settles a lot quicker, but it’s best to let the cake in the fridge to be nice and cool before serving. 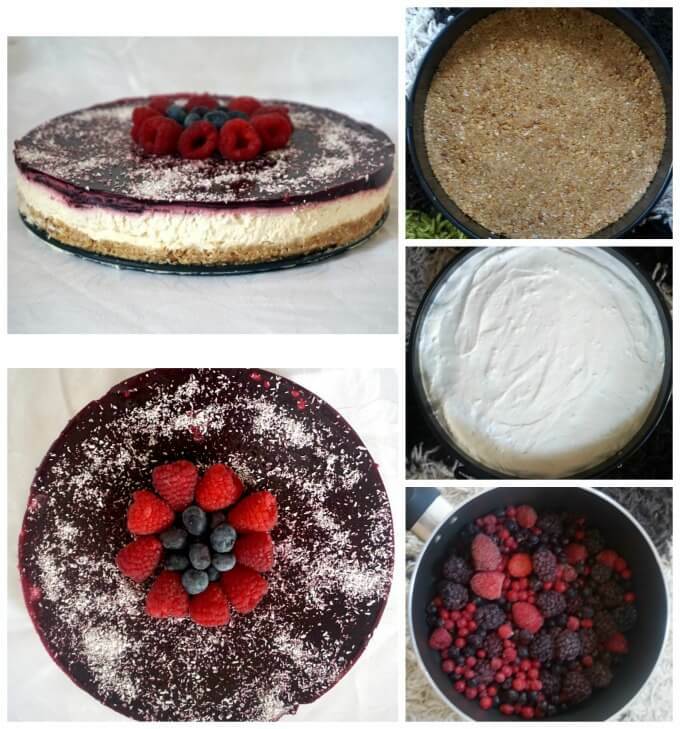 If you’ve liked the COCONUT CHEESECAKE WITH BERRY JELLY or any other recipe on the blog then don’t forget to rate the recipe and let me know how you got on in the comments below, I love hearing from you! You can also FOLLOW ME on FACEBOOK, and PINTEREST to see more delicious food and what I’m getting up to. 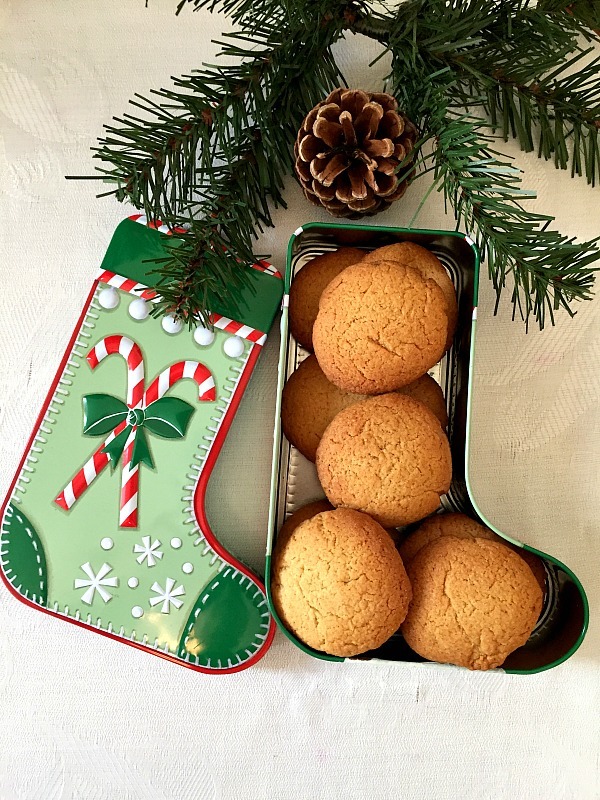 To make the base, place the biscuits into a bag, and use a rolling pin to bash them until they resemble breadcrumbs. Place in a bowl. Melt the butter, then add it to the bowl together with the crushed biscuits, and mix well. Place the mixture into a round baking tin that has either detachable walls or removable bottom, and press down firmly making sure it is spread into an even layer. To make the filling, beat the whipping cream until it holds stiff peaks. Add the coconut cream, soft cream cheese, dessicated coconut and maple syrup and mix well to get a smooth cream. Add the gelatine granules to a small bowl, add 5 tablespoons of water to it, then leave it to rest for 5-10 minutes until the granules are completely hydrated. Place the gelatine in the microwave for about 20 seconds until it becomes liquid. Mix it with the cream, then top the biscuit base with it. Refrigerate again. To make the jelly, add the frozen berries to a pan together with the water, and leave to cook for about 20 minutes, until it thickens into a sauce. Follow the steps above to make the gelatine. When the sauce is ready, pass it through a sieve to discard of any bits from the fruit, then mix it with the gelatine. Top the cheesecake with the jelly mixture, then refrigerated once again for about 4-6 hours, ideally overnight. I made your recipe to take to a family who needs to eat gluten-free. I can’t wait for them to taste it! Yummmmmy Delicious! Definitely keeping this recipe so I can make it for my own family. The masa is what helps it to have that Mexican taste that we love. I didn’t change even one little thing and it was perfect! Thanks again! I am glad you liked the recipe, it’s very tasty, I made it for my daughter’s first birthdday and it was a big hit at the party.